Mario Ruiz/Time Life Pictures/Getty Images. Called ballet's hottest choreographer in 2004, Christopher Wheeldon has choreographed more than thirty ballets in five years. His productions have almost always received high marks from critics, and ballet companies across the country consider it an honor to work with the thirty two year old. Wheeldon has been compared to ballet masters George Balanchine (1904–1983) and Jerome Robbins (1918–1998) almost since he began choreographing. And that comparison has never left him. Christopher Wheeldon was born in Somerset, England. He began lessons at the East Coker Ballet School when he was eight years old. He enrolled in London's Royal Ballet School at age eleven and trained until he was eighteen. And though he was a dancer in those early days, hints of his future as a choreographer shone through. "I enjoyed being the center of attention, being bossy," Wheeldon told Sarah Kaufman of the Washington Post. While home during summer vacation, the young dancer would recruit neighborhood friends into dance productions he wrote and choreographed. While still a student, Wheeldon won prizes for his choreography. At seventeen, he was one of five dancers chosen to compete at the Prix de Lausanne, an international dance competition held each year to help dance students kickstart their professional careers. One hundred and twenty dancers are chosen to compete; only fifteen make the final round. The winner is awarded a study scholarship with the finest schools and dance companies in the world. Wheeldon won the Gold Medal in 1991. That same year, he was accepted into the Royal Ballet Company (RBC). "Dance has been my way of life since I was a child and I'll never give it up—it really is my reason for living." choreographers of all time, including Jerome Robbins and George Balanchine. Years later, his innate feel for choreography and his willingness to reimagine and rework traditional ballets would be favorably compared to these dance masters. Although he enjoyed dancing, Wheeldon never forgot the advice given to him by Sir Kenneth MacMillan, a respected British ballet choreographer who had more than forty ballets under his belt by the time he retired. Wheeldon shared with John Percival of The Independent, "I was summoned to the presence, and he told me, 'You seem to have some talent for choreography; you should take every opportunity you have to practice it and make ballets'." Wheeldon did as he was told and choreographed student-led productions for the Royal Ballet School, the London Studio Centre, and the School of American Ballet. He proved himself capable of working with large ballet corps (groups), a talent that set him apart from other young choreographers. Wheeldon quit dancing at the end of the spring season in 2000 to focus his attention and energy on choreography. Peter Martins, director of the NYCB, hired Wheeldon to be the company's first artist in residence, a position created just for him. Wheeldon was just twenty-eight years old. His first choreographed ballet as resident artist was Polyphonia. It was given its world premiere in January 2001 and received excellent reviews. Clive Barnes of Dance Magazine wrote, "There is not a step in Polyphonia that doesn't progress naturally from the step before it. The dance—prickly, angular—moves with the force of nature like the wind." Jackie McGlone of scotsman.com called the ballet an "immaculate masterpiece." Wheeldon won the London Critics' Circle Award for Best New Ballet for Polyphonia. A production in 2002 by the NYCB earned the Olivier Award for Best New Dance Production. 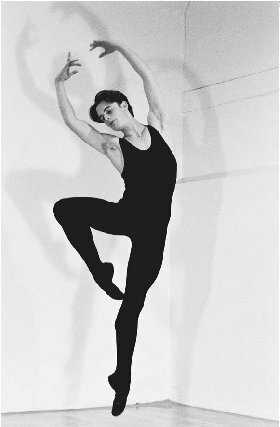 Christopher Wheeldon, pictured here in 1995, quit dancing in 2000 to focus his attention and energy on choreography. American dance critics, wrote in the New York Times, "No ballet choreographer of his generation can match his imaginative use of the classical vocabulary." And that is what the budding choreographer became known for: his ability to modernize the classical ballet without sacrificing its strength and beauty. Wheeldon credited his training. "I feel quite lucky and grateful for growing up in the environment of theatrical story ballets and a very solid, very old tradition in ballet," he was quoted as saying in 2001. That same May, Wheeldon was named resident choreographer for NYCB, another position created just for him. While choreographing ballets for the NYCB, Wheeldon had his creative hands in projects for other organizations, including the Boston Ballet, the Royal Ballet, and the San Francisco Ballet. He won countless awards for his many ballets, and more than one New York critic called him "the best thing to happen to ballet for 50 years." Wheeldon admits to not believing his own publicity. He explained his stance to Jackie McGlone of scotsman.com: "I simply do not set too much store by the good reviews, because then I don't have to set too much by the bad ones." Wheeldon got his first taste of bad publicity with his Broadway debut ballet, The Sweet Smell of Success. The 2002 ballet was a stage adaptation of a film by the same name. Without exception, the musical is considered Wheeldon's weakest work. Critic Gerald Rabkin wrote a review for CultureVulture.com in which he called Wheeldon's choreography "merely serviceable," meaning it did the job but was nothing to get excited about. Wheeldon's debut was not without value, however, as it introduced him to actor and writer John Lithgow, who performed in the musical. Their next collaboration (in Carnival of the Animals ) was considered more successful. By June 2002, Wheeldon had produced the ballet Morphoses. He followed that up with several projects, including a 2003 ballet set to the score (music) of Camille Saint-Saens' Carnival of the Animals. The ballet was given the same title and included verse written by Lithgow. The year 2002 brought Wheeldon together professionally with Scottish composer James MacMillan. The two ballet greats collaborated on Tryst, performed by the Royal Ballet Company. MacMillan was thrilled at the opportunity to work with Wheeldon. In an interview for Ballet Magazine in 2003, the composer reminisced, "He has shone a light into the music, which is a new and unexpected perspective. There is something in both our work that evokes this sense of mysticism, mystery or otherness. I was aware of that corresponding sense of beauty ... [which] allowed me to revisit the music of Tryst and see again how vivid the experience was when I wrote the music initially 14 years ago." Tryst was just one of a number of Wheeldon/MacMillan projects performed by the RBC. In 2004, Wheeldon was commissioned (hired) by the Pennsylvania Ballet to choreograph a ballet of his choice. Wheeldon chose one of his favorite ballets, Swan Lake, and was given $1 million to make it happen. He was indecisive about how to proceed with the project. Should he go the traditional route and perform the entire (and very long) ballet? Or would it be better to modernize the production a bit, putting a new spin on the narrative? In the end, the reviews spoke for themselves. Janet Anderson of the Philadelphia City Paper praised Wheeldon's inventiveness. "The choreographer managed the impossible, keeping all the classic's famous moments and yet creating something magnificently, even wildly, original for Pennsylvania Ballet." Wheeldon incorporated different performance styles into his Swan Lake production. While keeping the choreography traditional, he updated the sets and costumes and incorporated a modern energy into the classic. When Chris Wheeldon is compared to Jerome Robbins, the young choreographer takes that as a compliment. Wheeldon studied with Robbins in the early stages of his career. The budding choreographer was just nineteen years old when he danced his first workshop with Robbins. The master punched Wheeldon on the shoulders and muttered "Mmmm— not bad!" As Wheeldon told Ballet magazine in 2003, "He was a far more generous man than people give him credit for. That little punch—because he didn't have to say anything—was enough for me to give me the boost that I needed." Jerome Robbins was born October 11, 1918, in New York City. He dropped out of college when he realized his limited potential as a student and found work training as a ballet dancer at the Sandor Dance School. In 1944, Robbins tried his hand at writing a ballet, and his first, Fancy Free, opened at the Metropolitan Opera House in April that year. The ballet received twenty-four curtain calls; Robbins was an instant hit. He had teamed up with the then-unknown composer Leonard Bernstein (1918–1990), who wrote the score for the musical. The team produced another hit in December. On the Town cemented Robbins's place in ballet history, and—with 66 ballets to his credit—he remained the master of his craft until his death more than fifty years later. Robbins enjoyed particular success with his Broadway titles, including West Side Story (another Bernstein-Robbins smash hit). His role in this production won him two Academy Awards (one for direction, one for choreography), but this was also the point in his career in which he earned a reputation as being a ruthless perfectionist. It was a reputation that would be with him throughout his life. 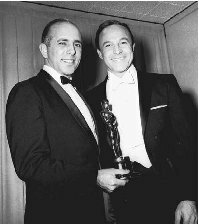 Jerome Robbins (left) with famous actor/dancer Gene Kelly. Regardless of reputation, Robbins's style paid off. The choreographer won countless awards for his work throughout his career, and his name is attached to such famous musicals as Fiddler on the Roof and Gypsy. In 1998, Robbins died in his home from a stroke at the age of seventy-nine. Robbins is largely credited, along with George Balanchine (1904–1983) and Lincoln Kirstein (1906–1996), with establishing the New York City Ballet. Kirstein, who supported the arts through his financial donations, helped fund and bring to life Balanchine's vision of a ballet school. Once the American School of Ballet was established, Robbins and Balanchine set out to make the New York City Ballet the most renowned ballet company in the world. invitation is basically to be told you've made it to the big-time. Wheeldon had been to the festival in 2003 with the San Francisco Ballet, where the troupe performed Rush. For that production, Wheeldon won the coveted National Dance Award for Best Choreography in 2004. Since 2000, Wheeldon has created more than thirty new productions, though he lost track of the exact count. In early 2005, the award-winning choreographer worked with the NYCB to create After the Rain, his eleventh ballet with the company. The ballet was meant to be a swan song (the last performance) for veteran ballet dancer Jock Soto, who was on the verge of retiring. After the Rain garnered high praise for both Wheeldon and Soto. Wheeldon also pleased critics with his American in Paris and There Where She Loved. By mid-July 2005, the choreographer was spending his time with the San Francisco Ballet, working on his new production, Quarternary. The name means "four parts;" each act of the ballet focuses on a specific season in the cycle. Wheeldon loves the San Francisco Ballet dancers. "They're quick," he told Rachel Howard of the San Francisco Chronicle. "There's no waiting while someone sulks because they don't like the steps." The thirty-two-year-old Wheeldon lives in New York's Upper West Side and enjoys a second home in Spain. He keeps his private life private, but doesn't mind talking about his work. In his 2005 interview with Jackie McGlone, the master craftsman mused, "I sometimes wonder if I'm going to fail the next time, and indeed whether there's going to be a next time. Perhaps that's why I feel that the time has come to take a step in another direction. And I will; I will." Carman, Joseph. "The Evolution of Christopher Wheeldon." Dance Magazine (May 1, 2003). Kaufman, Sarah. "Ever on Their Toes." Washington Post (February 24, 2005): p. C01. Mead, David. "Edinburgh Festival Preview: Pennsylvania Ballet in Wheeldon's Swan Lake. Dancing Times (July 2007). Percival, John. "Dance: Sweet Success." The Independent (May 6, 2002). Porterfield, Christopher. "In the Ear, Out the Foot: A forward-looking traditionalist, Christopher Wheeldon, 31, is ballet's hottest choreographer." Time (May 10, 2004). Anderson, Janet. "Swan Lake." Philadelphia Citypaper.net (June 10–16, 2004). http://citypaper.net/articles/2004-06-10/dance.shtml (accessed on August 9, 2005). "Christopher Wheeldon: new ballet." Royal Opera House (February 12, 2005). http://info.royaloperahouse.org/News/Index.cfm?ccs=714 (accessed on August 9, 2005). "Christopher Wheeldon, Resident Choreographer of New York City Ballet." New York City Ballet. http://www.nycballet.com/about/cwheeldon.html (accessed on August 9, 2005). Howard, Rachel. "Christopher Wheeldon is taking S.F. Ballet to choreography's cutting edge—and to Paris." SFGate.com (July 1, 2005). http://www.sfgate.com/cgi-bin/article.cgi?file=/c/a/2005/07/01/DDG9PDEKHG18.DTL (accessed on August 9, 2005). McCarthy, Brendan. "Christopher Wheeldon, Choreographer." Ballet.co Magazine (August 2003). http://www.ballet.co.uk/magazines/yr_03/aug03/interview_wheeldon.htm (accessed on August 9, 2005). McGlone, Jackie. "Leap of Faith." Scotsman.com (July 17, 2005). http://news.scotsman.com/features.cfm?id=1635022005 (accessed August 9, 2005). Vaill, Amanda. "A Biography in Brief." Jerome Robbins. http://jeromerobbins.org/bio-vaill.htm (accessed on August 9, 2005). Wood, Astrida. "Chris Wheeldon Shines in 'After the Rain'." Show Business Weekly (January 26, 2005). http://www.showbusiness weekly.com/archive/318/dance.shtml (accessed on August 9, 2005).